Sear filet on all sides: Season the fillet generously with salt and pepper. Heat a tablespoon or two of oil in a large pan on high heat. Sear the fillet in the pan on all sides until well browned (hint: do not move the fillet until it has had a chance to brown). Brush the filet with mustard: Remove the filet from the pan and let cool. Once cooled, brush the fillet on all sides with mustard. Prepare the mushroom duxelles: Chop the mushrooms and put them into a food processor and purée. Heat the sauté pan on medium high heat. Transfer the mushroom purée into the pan and cook, allowing the mushrooms to release their moisture.When the moisture released by the mushrooms has boiled away, remove the mushrooms from the pan and set aside to cool. Wrap filet in mushroom paste and ham: Roll out a large piece of plastic wrap. Lay out the slices of ham on the plastic wrap so that they overlap. Spread the mushroom mixture over the ham. Place the beef filet in the middle, roll the mushroom and ham over the fillet, using the plastic wrap so that you do this tightly. Wrap up the beef filet into a tight barrel shape, twisting the ends of the plastic wrap to secure. Refrigerate for 20 minutes. 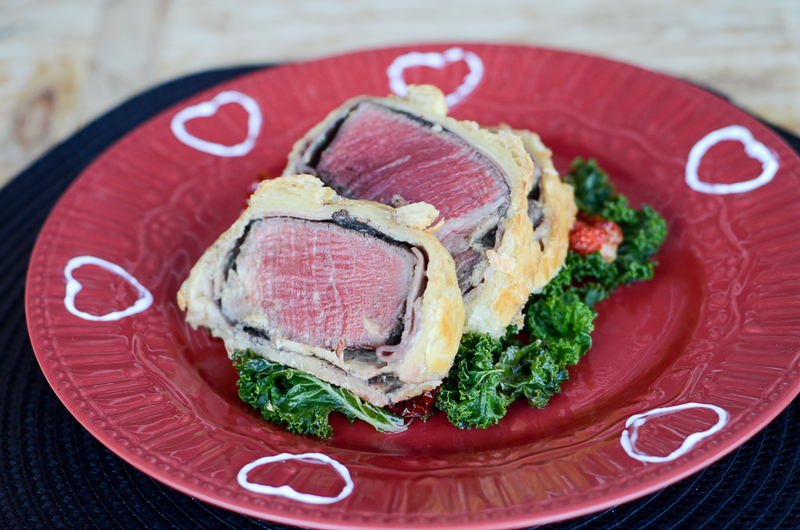 Roll out puff pastry, wrap beef filet: On a lightly floured surface, roll out the puff pastry sheet to a size that will wrap around the beef fillet. Unwrap the fillet from the plastic wrap and place in the middle of the pastry dough. Brush the edges of the pastry with the beaten eggs. Fold the pastry around the fillet, cutting off any excess at the ends (pastry that is more than 2 layers thick will not cook all the way, try to limit the overlap). Place on a small plate, seam side down, and brush beaten egg yolks all over the top. Chill for 5-10 minutes. Brush with egg wash: Place the pastry-wrapped fillet on a baking pan. Brush the exposed surface again with beaten eggs. Bake in oven: Bake at 400°F for 25-35 minutes. The pastry should be nicely golden when done. To ensure that your roast is medium rare, temp Wellington and Pull out at 125-130°F for medium rare. Remove from oven and let rest for 10 minutes before slicing. Prepare red wine sauce: Heat the oil in a medium saute pan and add the shallot. Cook for about 5 mins over medium heat until soft and golden. Add the red wine, increase the heat to med/high and cook until the wine is reduced by about 2/3. Add the stock and continue to cook for another five minutes. Strain the sauce using a fine mesh strainer and discard the solids. Return the sauce to the pan over medium heat. Swirl in the butter one pat at a time until each piece is fully dissolved. Season with salt and pepper. Sauce should be slightly thickened and glossy. Prepare Kale and Sundried tomato side: Heat the olive oil in a Dutch oven or a 3- to 4-qt. soup pot over medium heat. Add the garlic and sauté, stirring, until starting to brown, 2 to 3 minutes. Add the sun-dried tomatoes and stir to combine. Add the kale, tossing to coat it well with the oil. Season with the salt and a few grinds of pepper and continue stirring until all the kale is wilted.